This list is far from complete, and the church is seeking any information that might help in filling in the gaps! 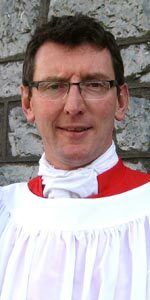 Mark Duley came to Ireland in 1992 as organist and director of music at Christ Church Cathedral Dublin. He now pursues a busy freelance musical career both in Ireland and further afield. In addition to his post in Galway, he is the founder-director of his own professional choir Resurgam, and holds the posts of chorusmaster to the RTÉ Philharmonic Choir and artistic director of Pipeworks. As both conductor and organist he has appeared with most of the major Irish ensembles and has given organ recitals throughout Ireland, the UK, continental Europe and his native New Zealand. Assisting from time to time as deputy organists are the Rev’d Tom Gordon, Joy Buckley, Norman Duffy and Niall Carroll. Dottie Knauer assists with the direction of the choir.